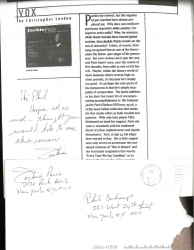 Note to Phil on a photo copy of a review from vocalist Jackie Paris! Paris, 1924-2004, was the only singer to tour as a regular member of Charlie Parker's quintet, and also performed with Lionel Hampton, Coleman Hawkins, Charles Mingus, and many others. Also features Paris' full signature on the envelope. A one-of-a-kind piece of Jazz history.